X-rays are a great tool to look at what’s going on in the body. 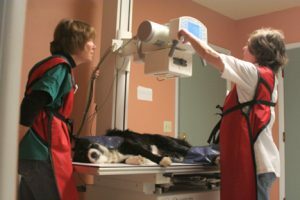 X-rays can not only be used to determine broken bones, but also to look at the lungs for pneumonia, the heart for signs of cardiac disease, the liver for signs of enlargement, the spleen for masses, and the kidneys size and shape. The things that can be revealed on an x-ray are endless making them a great diagnostic tool for both small animals and horses.